We are sure that Kevin Kennedy, Executive Director of GAB (Government Accountability Board) would love to know how the petitioners of District 22 feel about this action. and politely express your opinion. The GAB issued a press release ( http://thewheelerreport.com/releases/May11/0527/0527gab.pdf ) late yesterday afternoon stating they would not be certifying the 3 recalls of the Democratic senators this Tuesday (Holperin, Hansen and Wirch). They are making this decision based on "numerous factual and legal issues which need to be investigated and analyzed by agency staff prior to consideration by the Government Accountability Board members. Because of the strong likelihood that any finding of sufficiency or insufficiency by the Board will be appealed to a circuit court, it is imperative that the issues raised by these challenges are fully examined, and that a complete record is created for a court to consider." This is outrageous. They took a coward's way out by releasing this news after 4 PM on a Friday before a holiday weekend - the business day before the hearings. This action is motivated by politics. Moreover, the GAB asked the court for an extension of the time to consider the recalls. The court granted the extension. In this action, extending the review time yet again, they sought no decision from the court. As a result this arbitrary decision is illegal. The law on recalls stipulates that the GAB has 31 days to complete the review process. By not following our rights are violated. We will respond to the GAB and respond forcefully. We cannot let this happen to us without a vigorous challenge. Thanks for everything you have done but we are still in the fight. Let's use everything we can to battle fairly and honorably. If we do this we will ultimately prevail. Keep our Eye on the Goal - Holding our Senator Accountable. Late Friday afternoon (after 5 PM) a reporter called and asked me for a reaction to the news from the Government Accountability Board. I asked, "What news?" The reporter told me that the GAB had issued a press release 45 minutes earlier stating that they wouldn't be certifying our recall as scheduled this Tuesday, May 31. To say the least, I was shocked and, for one of the rare times in my life, speechless. The GAB states http://gab.wi.gov/node/1883 that they are taking this, action " because of the strong likelihood that any finding of sufficiency or insufficiency by the Board will be appealed to a circuit court, it is imperative that the issues raised by these challenges are fully examined , and that a complete record is created for a court to consider." This action is motivated by politics. From the timing of the announcement to the fact that only recalls of Democrat senators are being delayed points to this as being politically motivated. Also, how does the GAB know that there is a "strong likelihood" this will go to court? Who have they been speaking with behind the scenes? They have not communicated with us except for official filings and inquiries. These are only some of the concerns. When Senator Wirch challenged our petitions we answered that challenge forcefully. Of approximately 18,300 signatures submitted he challenged 4,043. We responded by rebutting 3,251 of those challenges. Last week the GAB verified 17,544 signatures which confirmed our rebuttals. As you know, we only need 13,537 signatures for the recall. At that time he also submitted only 20 affidavits purporting "fraud" after telling the press he had "mountains" of affidavits. 5 of those affidavits were filed by people who went to a drive-thru to sign the petition. What do we do? We are considering our response carefully. We may challenge this decision in a news conference. We may take them to court. We will challenge them in the press. I feel strongly that I wouldn't be representing the thousands of people who signed our petitions properly if I didn't aggressively challenge this decision. Ultimately the recall will go through. There will be an election that will replace Senator Wirch. That cannot happen too soon. Let's constantly keep our eye on the goal - holding our senator accountable. Burlington, WI- Jonathan Steitz, candidate for State Senate in the 22nd District, will be speaking to a local Tea Party group lead by Bonnie Ketterhagen in Burlington on June 2nd. Steitz will be speaking at Coach's Sports Bar and Grill at 8pm on 488 Milwaukee Ave, Burlington, WI. Steitz is standing up for his community and running for State Senate, and this event will be an excellent forum to learn about and spread Steitz's message. Steitz commented, "The Kenosha and Burlington areas can be a gateway to the state's economic rebound but we must elect the right leadership to implement policies that will support the local economy." If you have any questions regarding this event please contact the Steitz for Senate campaign at (262) 308-8885 or visit our website at www.steitzforsenate.com. There are two very good candidates that have announced they want to run against Wirch in the recall election: Fred Ekornaas and Jonathan Steitz. A primary election would be held on July 12 and a final election on August 9. This link http://www.youtube.com/watch?v=lADwUopEO5Q&feature=player_embedded#at=18 will take you to an internet video of Jonathan's announcement. It is only 11 minutes in length and will give you a good introduction to Jonathan. Note: the audio levels on this video are very low. You will need to turn your speaker's volume up quite a bit to be able to hear it. Quite Astounding; Wirch wants valid signatures thrown out. Next time you hear a Wisconsin Democrat demand that every vote be counted and every vote count, don't believe it, because they don't. Wisconsin Dems Seek To Throw Out Legitimate Votes and Recall Signatures. 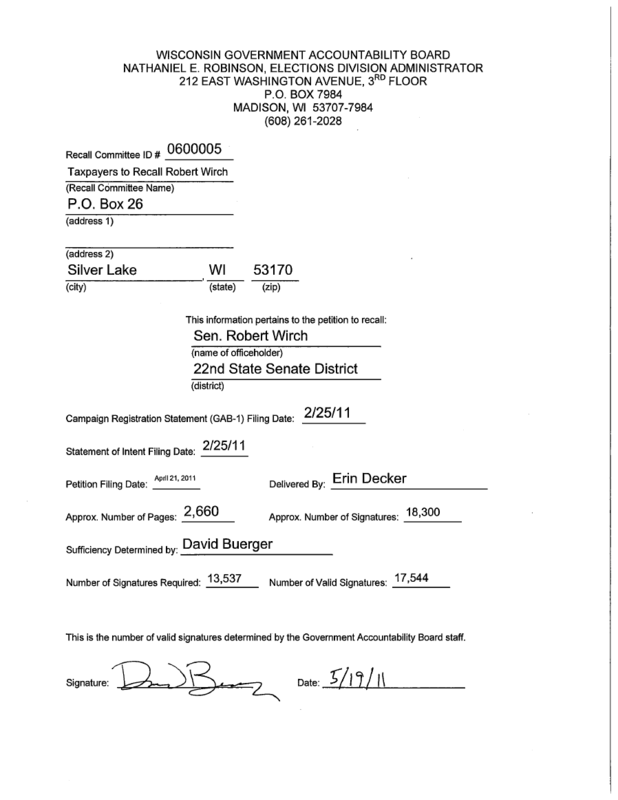 As previously reported, the Recall Wirch effort obtained an estimated 18,300 signatures to recall Wisconsin Democratic State Senator Robert Wirch, far in excess of the 13,537 needed. As further reported, the Wirch campaign has engaged in misleading "push-calling" to petition signers in an attempt to create the false appearance of fraudulent signature gathering. The Wirch campaign has submitted its challenge to the petitions, but could specify challenges only to 4043 signatures. Thus, even if every single challenged signature were thrown out, there still would be enough signatures for a recall election. So the Wirch campaign wants all petitions circulated by paid circulators thrown out if a single signature were invalid in the petition, even if all the other signatures were valid. The Recall Wirch group has submitted an extensive rebuttal of the accusations, and also extensive documentation that most of the challenged signatures were in fact valid. Putting aside the specific challenges to specific signatures, the tactic of the Wirch campaign is quite astounding. The Wirch campaign wants valid signatures thrown out. This tactic is similar to the attempts by Democrats in the Prosser-Kloppenburg recount to throw out thousands of valid votes because of supposedly improperly sealed ballot bags, even though the recount totals match almost precisely the election night and canvass totals. But of course, Kloppenburg only worries about such ballot bag security in places which votes heavily for Prosser. In both the Wirch recall effort and the Kloppenburg recount effort, Democrats seek to have election officials (and ultimately the courts I suspect) throw out votes and signatures as to which there is absolutely no evidence of fraud, based upon speculation, conjecture, and conspiracy theories. In the last four weeks, mainstream media outlets reveled in allegations of fraud made by the Democratic Party against the efforts to recall Senator Wirch, From the initial baseless allegations made by Democratic Chairman Mike Tate guaranteeing fraud, to the revelation of a single fake signature out of over 18,000.
mainstream media outlets have lapped up the allegations as undeniable facts. When Dan Hunt, Chairman of the Taxpayers to Recall Robert Wirch, held a Thursday press conference in Kenosha to address the allegations, no TV cameras or journalists from major news outlets (besides the Kenosha News) deemed it worthwhile to attend or report on. Hunt systematically disputed the allegations made against the Recall Wirch committee in Senate District 22. The Democratic Party challenged a total of 4,043 signatures out of 18,300 signatures gathered in Senate District 22. Without disputing any of the Democrats allegations of fraud, the GAB could throw out all 4,043 signatures and the Recall Wirch committee would still have enough signatures to trigger a recall election. But after “extensive analysis,” the Recall Wirch committee submitted what Hunt called a “strong rebuttal” of 3,251 of the 4,043 signatures challenged by the Democratic Party. Despite Senator Miller’s claim of “overwhelming evidence,” the Democratic Party obtained 20 affidavits from signers alleging fraud on the part of circulators. This amounts to 1/10 of 1% of the total signatures gathered by the Recall Wirch committee. Even that appears to be generous. So this means at least 9 recall elections – 6 against Republicans, 3 against Democrats – would be held on July 12, if indeed the GAB goes ahead with its plan. A few other recall petitions on each side are outstanding and haven’t reached their deadlines. But the strong likelihood is that there would be 9 elections on July 12. With 33 Senators in Wisconsin, that represents 27% of the body. That would occur only a couple months from now. As expected, a Dane County, Wisconsin court ruled that the Government Accountability board could extend deadlines for examining recall petitions for the purposes of holding all the recalls on one date – July 12. There were statutory deadlines on the time frame of examining the petitions that stood in the way of this consolidation, but the judge apparently has agreed to waive them. Days after the Madison rally, Tea Party leader Dan Hunt of Kenosha filed recall papers against state senator Bob Wirch, one of the 14 Democratic state senators who fled the state in an effort to avoid addressing the Walker bill. Another Tea Party leader, Kim Simac of Eagle River, did the same against Jim Holperin, another senator who fled the state. The petition drive to force a recall effort is in full force at the writing of this column, with the hope that enough signatures will be gathered to force a special election against Wirch, Holperin, and potentially Dave Hansen of Green Bay before the end of June. Who Might Benefit Most From Fake Signature In Recall Wirch Petition? The Committee to Recall Robert Wirch gathered 5,000 signatures more than the required 13,500 signatures needed. Despite accusations that the signature was recorded by a paid out-of-state organizer, the name listed on page 362 is that of Kevin Pursell who lives and works in Kenosha, WI. Furthermore, every other signature on Pursell’s page is valid and has been validated according to Hunt. Clearly, one signature will not make or break the Recall Wirch effort that gathered over 5,000 signatures more than was needed. Unless the widespread collection of fraudulent names is discovered (which thus far, none has been uncovered), evidence does not point towards the Recall Wirch Committee benefitting much from the use of a single fraudulent signature. But when one asks the question cui bono? There is no question which side benefits more.